Crystal Balance techniques are based on Traditional Chinese Medicine, Reflexology, Aromatherapy, Sound Application, and Crystal healing by Michael Gienger, and later developed by Monika Grundmann with Crystals and Gemstones. Many years of natural healing processes have transformed into the concept of Crystal Balance, an internationally successful application with many possibilities. The aim of Crystal Balance is a step-by-step process of health and well being through Crystal Massage. 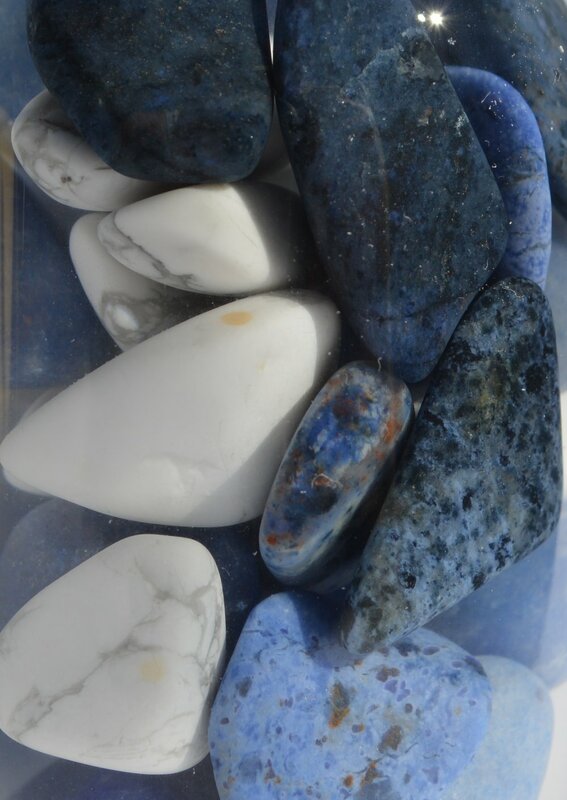 Monika’s work uses different types of stones and gems for different healing techniques, combined with the use of Crystal oils, for deep relaxation as well as the healing of the stones. This physical well being reflects in every aspect of our lives! This holistic approach is fundamental to the Crystal Balance method, but it is not a therapy in the medical sense. Its aim is to help our bodies relax and recover! Crystal Balance is a fascinating system for mental and physical well being. It covers an array of healing arts from around the world, from energy healing with meridians, chakras, to body communication and message therapy. The Crystal Balance can be used both in the private world, as well as in cosmetic and massage practice, on the menu, at Day and Resort Spas. Slowing down to a pace that will bestow positive effects on our physical, mental and spiritual levels. Monika’s education in Massage therapy and cosmetology led her to develop her interests in the power of touch….and then through education in Shiatsu, Aromatherapy, Bach Flower remedies, Color and Sound treatments, and work with Michael Gienger in Crystal Massage Therapy. She then began to incorporate crystals in her own treatments in various ways. She went on to study “Individual Therapy” with Rainer Strebel…The concept of the work, Crystal Balance, was now completed.This work is a culmination of the past 19 years, with the developed concept of Crystal Balance. She know teaches and shares the information through seminars and courses through out Europe. She has written 2 books on the knowledge of Crystal Massage and Healing. She hopes that you can learn from and embrace the knowledge of this work, and the power of the gemstones on the body. Rediscover the joy of living! 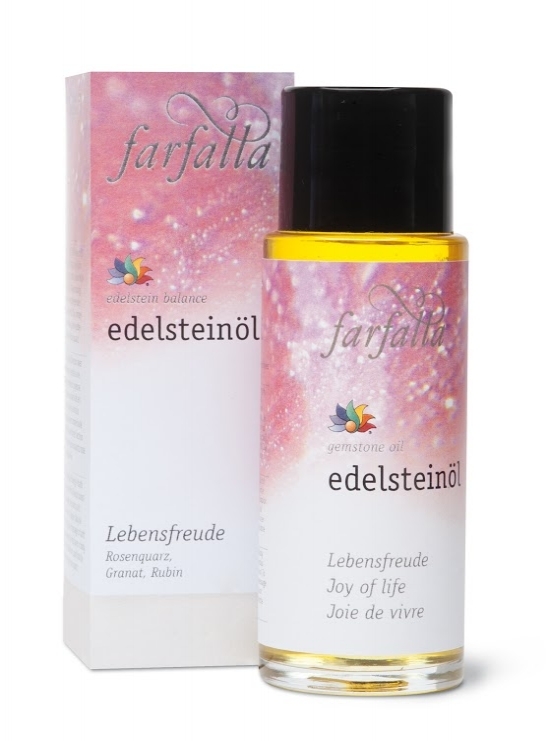 A bath or massage with this oil helps boost vitality, courage, sensuality and self-confidence. To enhance the effects, each bottle contains a small gemstone. Enjoy a sense of composure! This oil promotes emotional balance and stability, strengthens self-confidence and helps overcome fears. It enhances self-awareness and creativity. To enhance the effects, each bottle contains a small gemstone. Re-awaken your mind and body! This oil energises, encourages and helps to re-establish control and productivity. To enhance the effects, each bottle contains a small gemstone. Experience inner calm! 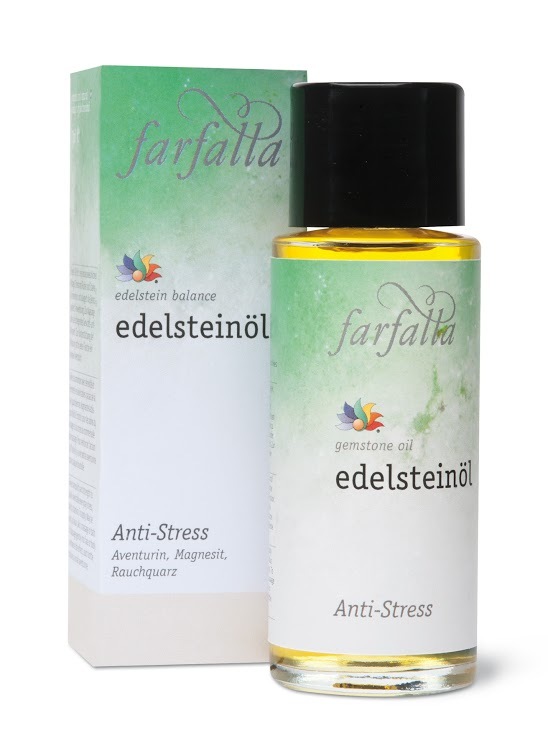 This oil promotes the tranquillity and strength needed to tackle everyday stresses, while boosting stamina. To enhance the effects, each bottle contains a small gemstone. Rediscover your personal centre! This oil stimulates positive energy and releases inner tension, helping to relax both mind and body. It encourages serenity and a feeling of ease. To enhance the effects, each bottle contains a small gemstone. Recapture feelings of your youth! This oil aids in purifying mind and body. It cleanses and purifies the skin, diminishes anxiety, frustration, and negativity, while enhancing vitality and well-being. To enhance the effects, each bottle contains a small gemstone. Epidote, Ocean Agate, and" Zoisite with Ruby"